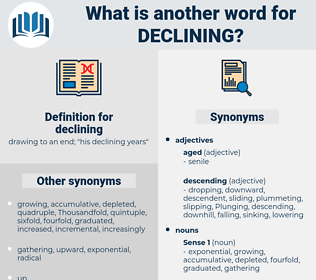 What is another word for declining? drawing to an end; " his declining years"
depreciating, descending, Collapsing, trend, plummeting, increasing, rising, lowering, Plunging, Cancelling, receding, reconsidering, idling, undermining, disappearing, Denying, rejection, indulging, streamlining, deepening, Dipping, advancing, shrinking, Detracting, losing, lost, downsizing, backsliding, withholding, faltering, Depleting, dying, withdrawing, Constituting, lightening, yielding, degrading, tumbling, Ignoring, lessening, years, worsening, sinking, withering, departing, dismantling, fewer, exceeding, subsiding, eroding, moving, retreating, exacerbating, Curtailing, growing, Diluting, Alleviating, belonging, accepting, lagging, weakening, Disallowed, scaling, failing, bending, Dismissing, bypassing, Discounting, Rejecting, altering, Refusing, landing, aggravating, Overstepping, closing, regressing, Impairing, Comprising, minors, tightening, shifting, contracting, Relieving, Bridging, narrowing, shortening, restricting, using, softening, wondering, turning, sentence, Renouncing, limiting, abating, giving, coming, reviewing, Educating, Phasing, Avoiding, engaging, imports, training, resulting, opposing, damaging, surpassing, Reversing, missing, curbing, trimming, tampering, compromising, Hampering, festering, Overcoming, <, Cropping, relaxing, Weathering, exhausting, thinning, easing, backing, forging, shedding, passing, returning, Forming, cutting, deteriorating, less. stiff, erect, unbending, upright, rigid, inflexible, elevated, raised, upraised. I am in earnest in declining to sell it. Domestic production of oil and gas is still declining.